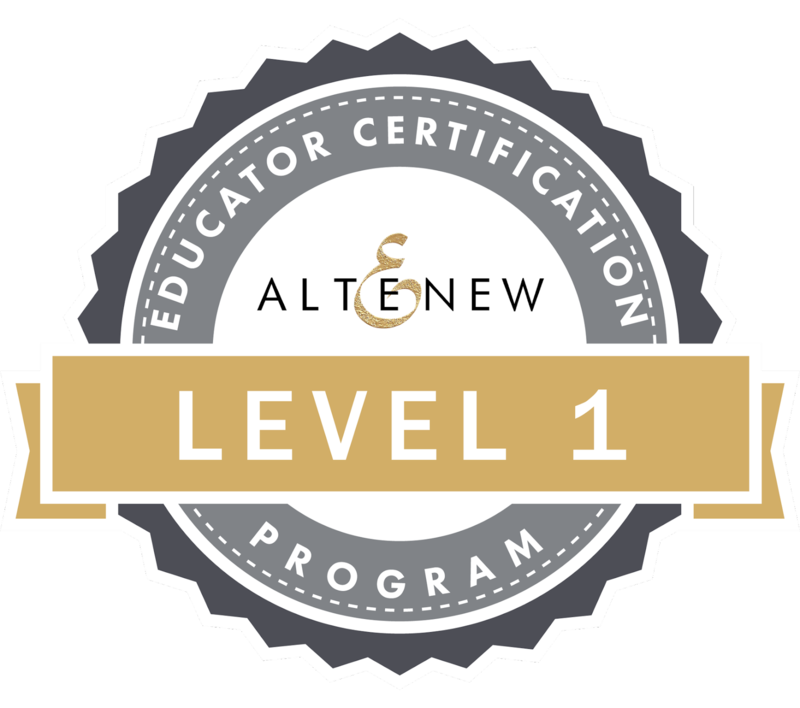 I'm a little behind the game but I just signed up today for the One-Layer Wonders Class at Altenew Academy. It is being taught by the always funny, always wonderful Kelly Latevola. I hadn't planned on taking this class (I'm behind on several) but I saw so many gorgeous class examples by students that I just had to sign up! So here is my day 1 homework...just a little behind! Baground stamp is from The Ton Stamps, the word "you" is from CTMH and "beautiful" is from Concord & 9th. Stay tuned...more lessons and homework to come! Hi one and all! 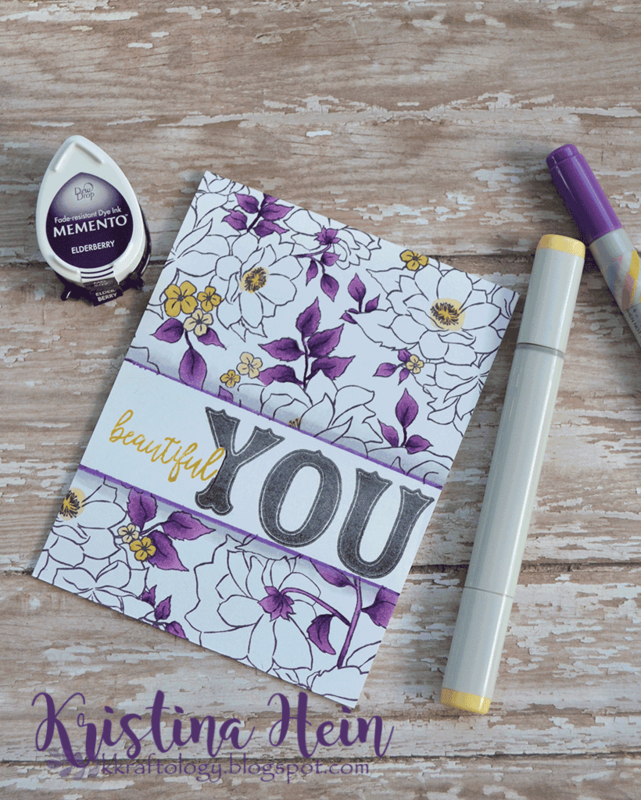 I've got a quick post to share with you today! 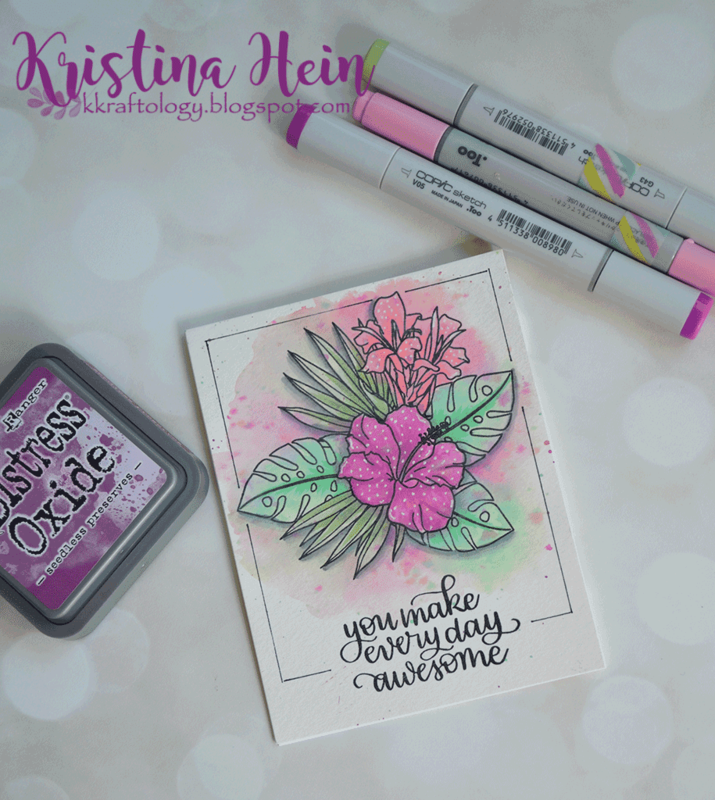 I have been playing along with Kathy Racoosin's 30 day coloring challenge and I actually completed a full card! You can find more details about the challenge on Kathy's blog right HERE. The main point is just that you color a little bit every day for 30 days in a row. That's it! Five minutes all you have?? Fine! Colored one leaf? Awesome! Can't play every day? No problem! Play along when you can! Super easy and super fun! So, here's my project for today! I started by smooshing three different colors of Distress Oxide inks directly onto watercolor cardstock. I used Shaded Lilac, Wilted Violet and Seedless Preserves. I then sprayed it liberally with a pearl shimmer spray. I soaked up bits here and there with a paper towel and dryed it with my heat gun. I felt a few spots were splotchy yet so I repeated. Once it was dry, I sprayed it with clean water and blotted it up with a paper towel. Then I just stared at it. It was lovely but I had no clue what to do with it! I looked around on my very messy craft desk and a stamp set jumped out at me. It's from Gina K Designs and is called Through Thick and Thin. You can find it on Gina's website HERE. I stamped the images using my Misti just in case I didn't get good coverage since I was stamping on watercolor paper. Once that was finished I thought about it a little more. What could I do to add a little something extra to this piece? Copic markers!! I took T3 and T1 and went around the outside of all the flowers. I loved it so much I also added the same two colors to the shadowed areas of the stamp. Then I couldn't decide where to put a sentiment over all of that loveliness, so I didn't! 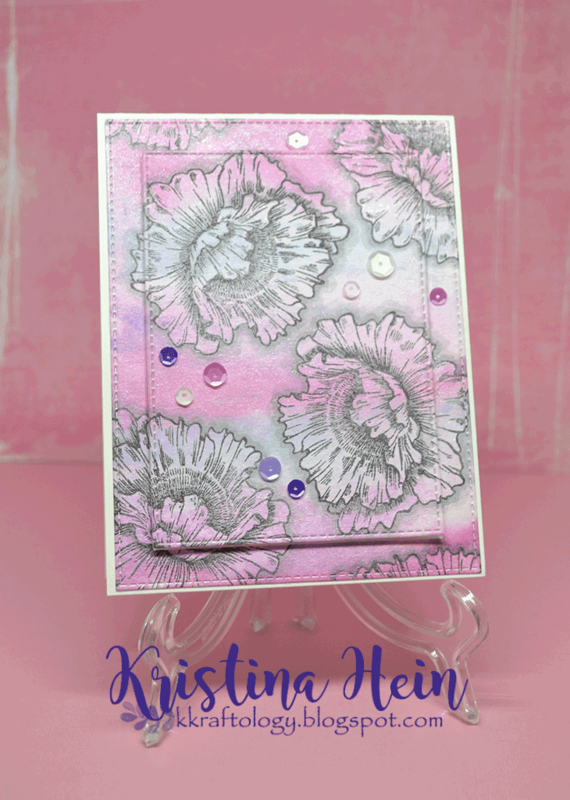 I cut it out with two different stitched rectangle dies from MFT stamps. 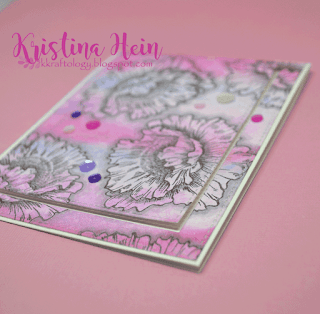 The outside layer I adhered directly to the card base and used craft foam on the center layer. I happened to have a little baggie of sequins laying out that were the perfect accent. And that's it! One close up picture just because! Hope you find time to join in!